Although it was first mentioned in Navy documents in 1995, the Command Master Chief (CMDCM) program was not fully fleshed out until the release of OPNAVINST 1306.2D, “Fleet, Force, CNO-Directed, and Command Master Chief Program.” Established to buttress the strength of the chain of command by providing a constant liaison between commanding officers and enlisted personnel, the CMDCM position was tasked with the formulation and implementation of policies in areas that directly affect Sailors on an everyday basis, such as training, discipline, job satisfaction, morale, and health and well-being. Commands that have 250 more enlisted Navy personnel are assigned a CMDCM; for smaller commands, a Command Senior Chief (CMDSC) or even a Command Chief (CMDC) takes on the same duties. As the titles imply, Force Master Chiefs (FORMCs) and Fleet Master Chiefs (FLTMCs) perform the same functions as Command Master Chiefs except on much larger scales. 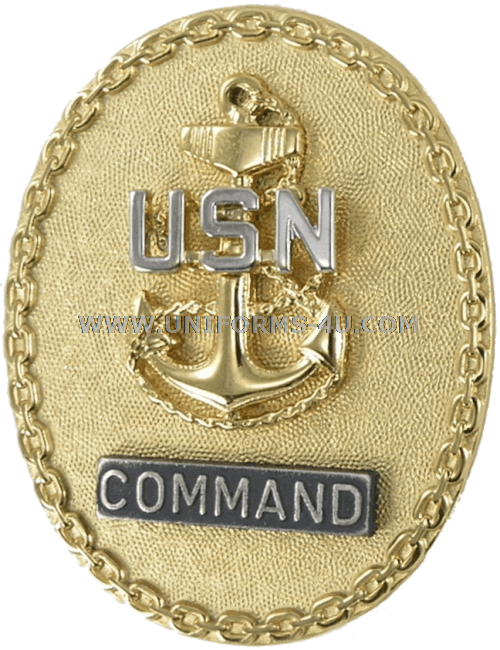 Selections for the non-commissioned rank of Master Chief Petty Officer of the Navy (MCPON) often come from Force or Fleet Master Chiefs, but it is not impossible for a Command Master Chief to “leapfrog” those positions to that of MCPON. For example, Joe Campa, the 11th MCPON, was selected for that position while serving as the Command Master Chief at Joint Task Force Guantanamo Bay, Cuba. Regardless of rank, all these positions are classified as “Senior Enlisted Leader” and the insignia are identification badges. They are the only identification badges allowed to be worn post-tour at the same time as another ID badge is being worn in the role of an incumbent.